Rachel Donadio reports for the New York Times on a number of repatriated antiquities back in their nation of origin. The list includes la dea di Aidone in Sicily, the Weary Heracles in Turkey, the Lysi frescoes on Cyprus, and the Euphronios Krater in the Villa Giulia. In rare cases, a repatriation is arranged so that a collector knowingly buys works identified as stolen to protect them from being further damaged or broken up. That happened in 1985, when the art collector Dominique de Menil bought some 13th-century Byzantine frescoes from a Turkish art dealer after the Greek Orthodox Church of Cyprus and government officials there identified them as having been stolen. When she was first offered the works, depicting Christ Pantocrator and the Virgin Mary with the Christ child surrounded by the archangels Michael and Gabriel, Mrs. de Menil was skeptical about their provenance. She quietly approached the Church of Cyprus, which said the frescoes had been secreted out of the apse and the dome of the church of St. Euphemianos in Lyssi, in a part of Cyprus that had been annexed by Turkey in 1974. Mrs. de Menil pledged to buy them — and return them to Cyprus in 20 years. The Menil Collection in Houston paid for the frescoes’ restoration, which took years. It built a bespoke minimalist space for them next to its Rothko Chapel and put them on display there in 1998. Themuseum had been hoping that Cyprus would extend the agreement and allow them to keep the works on view. But in 2012, Cyprus asked for them back, in a climate in which the new government and leadership of the Church of Cyprus have been increasingly aggressive in their campaign to call attention to the deconsecrated Christian religious sites in the areas of Cyprus that Turkey still controls. The Menil Collection made good on its promise. “Of course we were sad, but in the end we were very proud because ethically, from a moral point of view, this was exactly what needed to happen,” said Josef Helfenstein, the director of the Menil Collection. The frescoes are now on view in the Archbishop Makarios III Foundation Byzantine Museum and Gallery in Nicosia, Cyprus’s second-most visited museum, “until the day they will be put back in the chapel,” said John Eliades, the director of the Byzantine Museum. That might not be so easy. Rachel Donadio, Repatriated Works Back in Their Countries of Origin, N.Y. Times, April 17, 2014, http://www.nytimes.com/2014/04/20/arts/design/repatriated-works-back-in-their-countries-of-origin.html. Geoff Edgers had a terrific piece over the weekend profiling Victoria Reed, curator of provenance at the MFA Boston. Her position was created in 2010, and is unique in the museum community. She is according to the piece the only curator of provenance at an American museum, a post which can put her in an uneasy position, recommending that the museum should not acquire objects with insufficient history. Enter Victoria Reed, the MFA’s curator of provenance. Her job, which is almost as rare in the museum world as is the medallion, is to research works with questionable histories both in the collection and on the MFA’s shopping list. As a result, Reed’s other job is to break curators’ hearts. Through months of research, Reed traced the medallion to a museum in Gotha, Germany, that she knew had been looted during the Nazi era. With that information, the MFA’s jewelry curator, Yvonne Markowitz, put the brakes on its purchase. And in September, the Art Loss Register announced that S.J. Phillips Ltd., the dealer who had offered the medallion, would be returning it to the Castle Friedenstein museum. This can’t be an easy position to be in, but as more scrutiny attaches to museums, their collection, and their acquisitions, this kind of position will likely become more and more common. The market and dealers have not been adequately accomplishing this painstaking but necessary task, but perhaps they should be. Paying for a position like this can be difficult given the funding climate for many museums. The piece notes that the position was funded by an MFA Boston donor, Monica S. Sadler, who stipulated that her position should not be cut from the museum’s budget. So other benefactors to museums out there, if you are concerned with the practice at your local museum, give a gift with similar stipulations. Easier said than done of course, but all parties involved should be praised for undertaking an important piece of reform which really could continue to substantially change the importance of provenance research. The piece deals primarily with works of art and paintings, but a position like this which examines antiquities could have even more far-reaching consequences for repatriation and acquisition. Geoff Edgers, A detective’s work at the MFA, The Boston Globe, December 11, 2011, http://bostonglobe.com/arts/2011/12/11/detective-work-mfa/6iaei4YOQOj83s9u3YfDXO/story.html?s_campaign=sm_fb (last visited Dec 13, 2011). The First Circuit Federal Court of Appeals in Boston has held that the MFA Boston is entitled to retain ownership of this work. The work was the subject of a sale in 1938 to a dealer in Paris. The MFA Boston purchased this work in 1972, attorneys for the claimant contacted the Museum in 2007 about securing the return of the work, and the Museum brought suit in January of 2008 to seek a declaratory judgment of the work, precluding any claim by Ms. Seger-Thomschitz. The history of the work is complicated. It depicts the artist and Alma Mahler, the wife of Gustav Mahler. The claimant argued the painting was sold under duress by Oskar Reichel a physician and gallery owner in Austria. The work had been consigned on several occasions to an art dealer, Otto Kallir. Kallir later left Vienna, eventually coming to New York, and he brought this and some other works of art with him. He sent money to Reichel’s sons at this point. In 1939, the work was sent to Paris; in 1945 it was sold to a New York dealer for $1,500; Sarah Blodgett purchased the work in the 1940s; she gave the work to the MFA Boston in 1972. Claudia Seger-Thomschitz, though apparently not a blood relative of Reichel, had nonetheless been designated as the sole beneficiary of his estate and was described as his “select-niece”. The decision comes just as the Jewish Claims Conference has launched a database with 20,000 objects from the Einsatzstab Reichsleiter Rosenberg (ERR), the Nazi’s art-looting task force. For more on the database, see Catherine Sezgin’s excellent discussion here. Perhaps that database will urge more museums and private owners with objects once owned by Nazi-era victims, which was surely one of the primary motivations for the initiative. Because court actions are difficult options for claimants. In August the 5th Circuit Court of Appeals held Ms. Seger-Thomschitz did not have a timely claim to another Kokoschka work against Sarah Blodgett Dunbar who had inherited the work in 1973 because too much time had elapsed and Dunbar had acquired title to the work via prescription. Museum of Fine Arts, Boston, v. Seger-Thomschitz,— F.3d —-, 2010 WL 4010121 (1st Cir., 2010). Dunbar v. Seger-Thomschitz, 615 F.3d 574 (5th Cir., 2010). The Museum of Fine Arts, Boston has prevailed in its suit against Dr. Claudia Seger-Tomschitz, Museum of Fine Arts, Boston v. Seger-Thomschitz, No. 08-10097-RWZ (D. Mass. 2009). 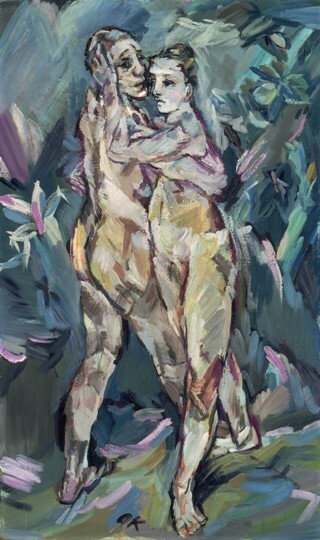 At issue was this work, “Two Nudes (Lovers)” by Oskar Kokoschka, 1913. The work has been on display “almost continuosly” since 1973 according to the Boston Globe’s Geoff Edgers. The museum brought suit to preclude any potential restitution suit, essentially asking the court to declare it the rightful owner of the work. The Museum brought suit back in January 2008, and in the complaint argued the “painting was never confiscated by the Nazis, was never sold by force as a result of Nazi persecution, and was not otherwise taken”. The potential claimant, Claudia Seger-Thomschitz, claimed the painting was sold under duress by Oskar Reichel a physician and gallery owner in Austria. The work had been consigned on several occasions to an art dealer, Otto Kallir who owned the Neue Galerie in Vienna. Kallir later left Vienna, eventually coming to New York, and he brought this and some other works of art with him. He sent money to Reichel’s sons at this point. In 1939, the work was sent to Paris; in 1945 it was sold to a New York dealer for $1,500; Sarah Blodgett purchased the work in the 1940s; she gave the work to the MFA Boston in 1972. [A]lthough the Reichel family never claimed compensation for any of the Kokoschka works that had been transferred to Kallir for sale, it did claim restitution for artwork and property that had been stolen by the Nazis. [T]he Reichel family never attempted to recover the painting after WWII, and there is no evidence that it believed the transfer was not legitimate. The evidence is undisputed that the members of the Reichel family had sufficient knowledge of Reichel’s ownership and transfer of the painting. Dr. Seger-Thomschitz also ―waited more than three years to assert her claim after she was on inquiry notice of her possible right to the Painting…The information necessary to pursue her claim was readily available to both [Dr. Seger-Thomschitz] and her counsel at that time. [T]he delay in bringing suit will prejudice the MFA because all of the witnesses with actual knowledge of the transfer are deceased. Any claim by Dr. Seger-Thomschitz that Oskar Reichel was misled when he transferred the painting to Otto Kallir in 1939 was ―pure speculation. 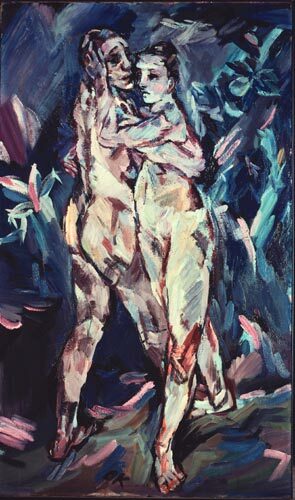 In the Boston Globe Geoff Edgers has the details of a dispute brought by the MFA Boston against an Austrian woman who claims an interest in this work by Oskar Kokoschka, Two Nudes (Lovers) 1913. It’s a declaratory judgment action, in which the museum is asking the court to declare it the owner, rather than wait for the claimant to bring suit. The potential claimant, Claudia Seger-Thomschitz, claims the painting was sold by Oskar Reichel a physician and gallery owner in Austria. In its complaint, the MFA Boston argued the “painting was never confiscated by the Nazis, was never sold by force as a result of Nazi persecution, and was not otherwise taken”. After the work was sold in 1939, the work was sent to Paris; in 1945 it was sold to a New York dealer for $1,500; Sarah Blodgett purchased the work in the 1940s; she gave the work to the MFA Boston in 1972. The Nazis occupied Vienna in early 1938. Over the next year, Reichel was forced to sell his gallery and close his medical practice, they said. Two of his sons left Austria. A third son, Max, died in a concentration camp. Reichel’s wife, Malvine, was deported to a camp during the war but survived. In 1943, Reichel died in Vienna of natural causes. However, does that injustice give the claimant an interest in the painting, which has been owned by the MFA Boston since 1972? The museum says no. It’s similar in nature to a claim brought by the Toledo Museum of Art last year, which I discussed earlier. In two earlier cases the institutions initiated their legal actions in quiet title actions. In this way the institutions can choose the forum and the relevant law which will apply to the action. This is a new strategy for art museums. Professor Jennifer Anglim Kreder has a short but informative article on the practice in an October 2007 issue of the Art, Cultural Institutions and Heritage Law Committee Newsletter, available on her SSRN page. She also details an action by the Detroit Institute of Art against the same heirs asserting a claim against the Toledo Museum of Art. This strategy actually discourages claimants from coming forward and seeking compromise. It’s been noted many times that these kinds of disputes are between two relative innocents. In such cases, there may often be room for reasonable compromise such as initial payments or title-sharing agreements of some kind. However if a claimant shows her hand early, she now will risk the possibility that an institution will quickly seek itself declared the owner and preclude any claim.